Carpartsnigeria.com is the first nationwide Auto (cars, trucks, motorcycles etc…). parts “Sales” website. Follow some simple steps in order to get your products and services to the E-Auto marketplace. If you are interested in becoming a www.carpartsnigeria.com “Vendor”, the process of registering is very simple; Either on our website at Vendor Registration Link or with any of our sales agents by calling our numbers on the contact us page. After the registration you will receive your confrimation email. Please read and confirm your registration. Make your payment and start listing your products. Its that simple!! Our goal at CarPartsNigeria.com has always been to create and grow a national auto parts search network, comprised of the premier auto and motorcycle parts and services in the nation. CarPartsNigeria.com hand picks only the top dealers who are known for their impeccable business practices. The CarPartsNigeria.com Network is unlike any other auto parts search network -- anywhere! Carpartsnigeria.com is committed to serving your company and helping your business grow by listing, and eventually allowing sales of your product/services professionally online. For as little as N2,200 a month, you can now become a Subscribed Vendor, and enjoy select privileges. Our members know, and you will discover, that associating with carpartsnigeria.com is a powerful source for your business success, growth and expansion. You will only be adding additional markets that were not readily available to you in the past. You have everything to gain, and nothing to lose. Ready to grow your sales become a Subscriber today, and get a taste of what we are all about. Carpartsnigeria.com is proud to offer this new program with confidence, because we believe our new Subscribers will enjoy an incredible success to be part of our network. Whether you're looking for a New or Used auto parts, you have come to the right place. CarPartsNigeria.com is the Internet's only LIVE search for auto parts across multiple vendors. Within seconds you can check the Auto parts inventories of over 80,000 of the top auto parts dealers in the country. You will receive results that are fast and accurate. It is that easy and simple. Here is how you get started finding the auto parts you need. Click the “buys Parts” on the Home page. Using the drop down menu, select the "Year" of the used car part or parts you wish to locate. 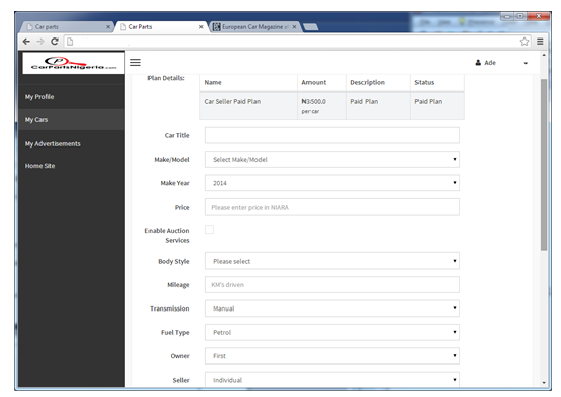 Using the next drop down menu, choose the "Make or Model" of the car or truck you are seeking new or used auto parts. Using the next drop down menu, choose the "Car Part" of the car or truck you are seeking new or used auto parts. 4. Now select the "Region or State" you wish to locate. CarPartsNigeria.com helps you find new or used car parts in a second. 5. You'll next need to enter your "District or City". This lets CarPartsNigeria.com show you the new or used auto parts closest to you. If there is more than one type of auto parts which could match your selection(s), Use our “SUBSTITUTE PART SEARCH” option. CarPartsNigeria.com will display a box listing the different options. You'll want to select the car parts or truck parts you need. Click on the "Search" button. That's it. 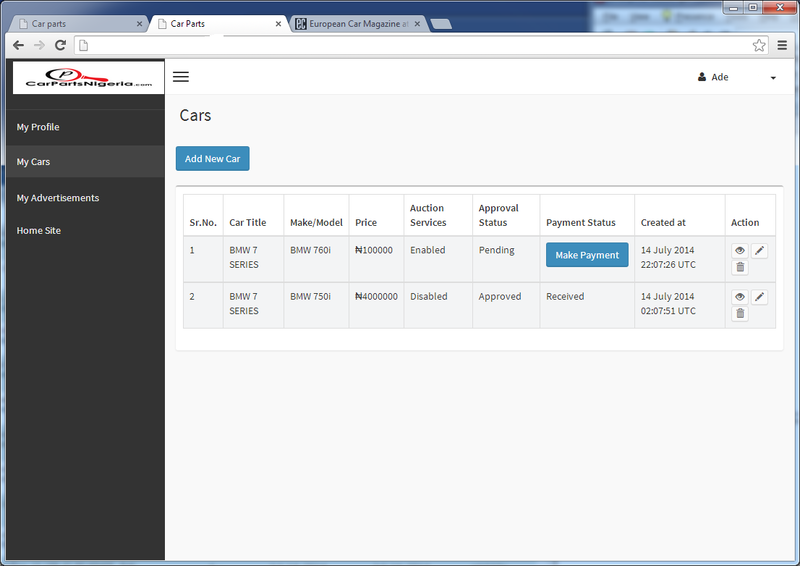 CarPartsNigeria.com will now search LIVE the inventory of hundreds of premier auto dealership on our network. Within 10 seconds the parts you are seeking will be displayed on your screen, with the auto dealership closest to you listed first. If the part or parts you're looking for were just added to the inventory a second ago, you will see them immediately!!! Since CarPartsNigeria.com is LIVE, that means you're getting realtime information about available Auto parts - not data which may have been collected days or weeks ago. You'll notice at the top of your screen a counter showing "New LIVE matches on your parts" The number indicates the count of additional auto parts which CarPartsNigeria.com has found for you. To view these along with your current list of parts, simply click on the "View Now" button and these auto parts will be added to your list. To contact the auto dealership, simply click on the "Contact" button. A box wills pop-up. In the first field enter your email address and then in the next field, enter your message. When you are ready to send, click on the "Send Message!" button. CarPartsNigeria.com will deliver your message instantly to the desk top of the dealer. There's no delay waiting for him to check his email. To insure you get the best price for your auto part(s), when calling the dealer(s) be sure and mention you found their auto parts on CarPartsNigeria.com!!!! When you're ready to search for another auto part(s), just click on the "New Search" button at the top of the page. You'll be returned to the main Search screen and you can begin a new search. Click Submit. At this time you have submitted your car to be listed for Sale. For car Sales listing you are done. Please read CPN’s Rules, policies and procedures for thorough understanding of guidelines. At CarPartsNigeria.com, we ensure your AD reach the expected targets audience within a reasonable time. With advanced engagement insights, multi-targeting features, and premium exchanges services, CarPartsNigeria.com offers a simple end-to-end solution for all digital brand advertising. Choose from a variety of advertising options to reach our large targeted audience. Custom advertising solutions are available. Enter the Title, Select TYPE of AD required, Choose the Plan and the description of your AD. If you have an already designed/customized AD that meets the requirements of CarPartsNigeria.com, then upload the image. AND SUBMIT. All customers that do have a pre-designed AD image can request a customized AD created for them by our in-house design team. Please create your AD specifications as shown below in size and resolutions. We will review your AD and an agent will contact you as soon as possible. Please review prices and Plans and give us a call at 803-3474788 or use our contact form. Right Side (275 x 88) – Constantly displayed on right side of the page. Left Side (140 x 200) – Constantly displayed under the left side menu of all pages. Left Side (140 x 80) – Constantly displayed under the left side menu of all pages. Bottom (600 x 160) – Constantly displayed on bottom of the page. N500 per month per page. We get a great deal of traffic through our Make/Model and Dealer Search pages. Please contact us for rates and opportunities to have an ad on these pages and target specific traffic to your site.